Medieval carvings hidden from sight for hundreds of years have been discovered in the roof of a church on the Norfolk/Cambridgeshire border. 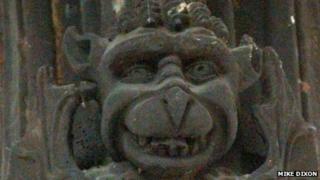 The 12 grotesques, demons and part-human sculptures were spotted in the nave of St Clement church in Outwell. Historian Dr Claire Daunton was using binoculars to study stained glass when she noticed the blackened figures. She said the exceptional quality of the sculptures could make them "unique" within European churches. Dr Daunton was carrying our research for a PhD at the University of East Anglia when she came across the sculptures. "They were extremely difficult to see even using the binoculars," she said. "They've been there since the 15th Century, so it's not really a discovery, but they have been blackened by age and probably by a coat of creosote that some helpful person put on them a long time ago. "They're very, very difficult to see with the naked eye." She has been able to study them more closely thanks to a local photographer, and a cherry picker machine brought in to allow access to the nave roof. "They're not all grotesques. Some are demons and some have human bodies with animal features such as a nose, or claws instead of hands," Dr Daunton explained. She also described the message conveyed by the statues as "rather ambiguous". "In the Middle Ages they were used to symbolise the fight between good and evil. "Normally good would be winning out over evil, but here in St Clement it's not quite so certain," she said. "If one looks closely at them and gets up on a cherry picker as we have done, you can see that the apostles are standing proud and the demon figures are bending over, possibly with the weight of sin. "Looked at from the ground it might seem that it was the opposite case - as if the bad figures are looming over the apostles - so it could be seen as rather ambiguous." Rev Alan Jesson, from St Clement, said fundraising to restore the statues would begin immediately. However, he estimated it would cost "several hundred thousand pounds" to clean and conserve the sculptures which are suffering from damp and insect damage. "What is fuelling this is the historic significance of these," he said. "We believe these to be unique in Europe because normally you would have the Christian figure overpowering the demonic figure but here it's the other way around."